Let the maths do the talking…. According to Wikipedia, the Reed was different things at different times … at one point being only 2 cubits, about 1 metre, long. They also called the 6-royal-cubit length “kalamos” which is called the Reed in the image above. Given that we’re dealing with civilizations that lasted thousands of years, it’s hard to know what’s what. I suspect that’s why there are different versions of the Royal cubit floating around … on the one hand, copy errors, on the other people using actual body parts to create measurements. It is my humble opinion that whoever came up with these things did it very logically, based on maths, and the metre and pi and phi. The big remaining question is how the heck did they get the metre. 2018-11-28: added (φe)/8.4, (10φ)/(11e + 1), and (φ)/(e + 1/e). Found out how to get proper φ in LibreOffice Maths. Added 1/(√(ln365.25/φ)). 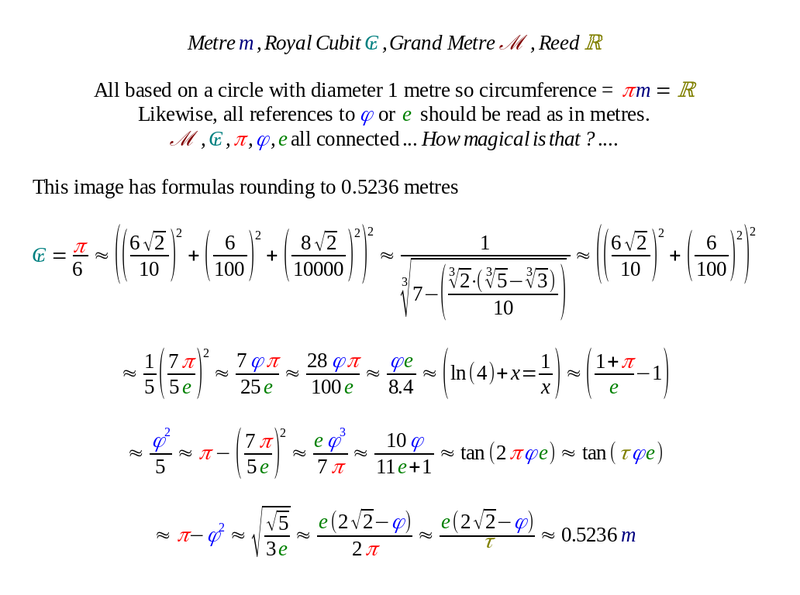 2018-12-03: Added formulas based on rewrites of the 5φe/7π == 1 formula, rearranged the Royal Cubit approximations to split more exact from less exact. 2018-12-04: Added pi^(1/e) to Grand Metre section, rearranged that section a bit, plus other tweaks. 2018-12-14: Added e/3√3, some other rearranging. 2018-12-13: Added √(√5/3e), a better formula using just e. Found by serendipity. 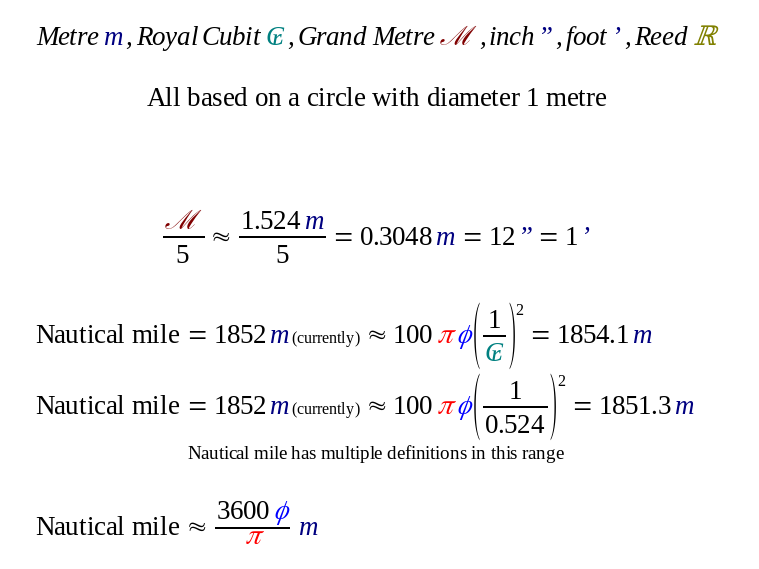 2019-02-10: Added formulas rounding to 0.5235m which somehow got dropped. This entry was posted in Cubit by iandoug. Bookmark the permalink.